Ultimate performance with added precision 36 colours. Lightfast & highly pigmented. Excellent colour and blending. Intermixable with Winsor & Newton Watercolor. How do the Water Colour Markers work? • A drawing is made with the marker which can then be transformed into a water colour painting by applying water with a brush. The sooner the water is applied, the better the resulting washes will be. For optimum results, the Winsor & Newton Water Colour Marker paper is recommended. • Can I mix the colours? How? The colours can be mixed on the paper or on a palette. • What is the drying time of Winsor & Newton Water Colour Markers? The paint from the marker dries quite quickly (average is less than a minute). The paint can be re-wet but its ability to be re-solubilized will vary slightly depending on the colour or/and the paper used. • How much ink is there in one marker? 3 ml • What coverage can I achieve with a W&N Water Colour Markers? Around 1500 cm2 or 1.62 ft2 of color dispensed from barrel. This will be colourdependant. • How should I store Winsor & Newton Water Colour Markers? The Winsor & Newton Water Colour Markers are best stored vertically. All caps should be replaced immediately after use. • What should I do if the nib has dried out? The nibs can be re-wet using a damp cloth. Avoid dipping the nibs in water to maintain the integrity of the paint inside. The best way to prevent the nibs from drying out is to put back the caps immediately after use. • What do I do if I get traditional water colour paint on my nib? • Water colour paint can be removed with a damp cloth. • How long will my nib last for? • The nib should last as long as the marker colour. • Can I replace the nib on my Winsor & Newton Water Colour Markers? • Winsor & Newton Water Colour Markers nibs cannot be purchased. • How do I clean up Winsor & Newton Water Colour Markers nibs? 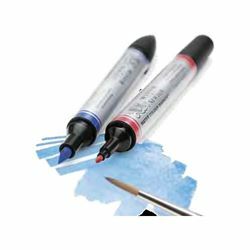 • Winsor & Newton Water Colour Markers nibs can be cleaned up by writing on a piece of paper to remove the dirt. • What temperatures can Winsor & Newton Water Colour Markers be used in? • All normal working temperatures, the same as traditional water colour (between 5 and 40ºC). • What is the difference between a dye based marker and a pigment based marker? • The main difference is the lightfastness. Pigment based markers are lightfast whereas dye based marker are fugitive meaning their colour will fade with time. Additionally the colour of the dye based marker has a tendency to separate into the individual dyes composing the colour, when making a wash on the paper. • What is the difference between a water-based marker and a solvent-based marker? • Winsor & Newton Water Colour Marker is a water-based marker and can, therefore, washed with water to create water colour effect on the paper. A solvent-based marker cannot be removed from the paper which is why these markers are also referred to as permanent even if the dye based formulations are not lightfast. • Can I use Winsor & Newton Water Colour Markers with other traditional water colour paint (tubes and/or pans)? • Yes Winsor & Newton Water Colour Markers can be used with water colour paint. For optimum results, use the Winsor & Newton Water Colour Marker paper. • Can I use Winsor & Newton Water Colour Markers with water colour mediums? • Winsor & Newton Water Colour Markers can be mixed with water colour mediums on the palette or on the paper. • Can I use Winsor & Newton Water Colour Markers with solvent based markers? • Winsor & Newton Water Colour Markers can be used with solvent based marker but it is not recommended when using the markers for a water colour application. • If Winsor & Newton Water Colour Markers are water-based then does it wash away? • Winsor & Newton Water Colour Markers have been formulated to create washes when mixed with water. Once the painting is made, it needs to be protected from water, preferably under glass. • Where can I use Winsor & Newton Water Colour Markers? • Winsor & Newton Water Colour Markers can be used on paper but to create a watercolour painting a suitable watercolour paper should be used. For optimum results, the W&N watercolour marker paper is recommended. • What surfaces can Winsor & Newton Water Colour Markers be used on? • Winsor & Newton Water Colour Markers should be used on watercolour paper; blending ability will vary according to the specification of the paper used. For optimum results, use with Winsor & Newton Water Colour Marker paper. • Why do the Winsor & Newton Water Colour Markers results vary on different types of paper? • Different water colour papers will give different effects and different levels of blending due to the individual specifications of the paper. For optimum results, use with the Winsor & Newton Water Colour Marker paper.